If you’re looking for an affordable way to promote your book, you can’t do better than with bookmarks. Bookmarks are more than just placeholders for lines of text; they can act as advertisements for your book. A bookmark is another way to drum up interest in your next soon-to-be best-seller!If you’re looking for an affordable way to promote your book, you can’t do better than with bookmarks. This is one of the least expensive ways to market yourself and your book. Our bookmarks are printed on a durable glossy paper stock and are in full-color. This Product is limited to authors with a shipping address within the United States. Estimated time from order placement to order delivery is 2-3 weeks. 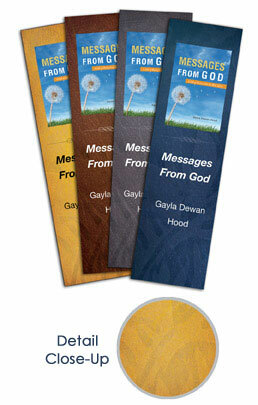 These bookmarks measure 2 x 7 inches and are printed on card stock. The book cover image used on these bookmarks is the final, author-reviewed cover that appears on your book. Color variance between the actual book cover and the image on the card should be expected. Xulon Press cannot honor special requests concerning design or presentation. Once submitted, orders cannot be changed. There can be no refunds or cancellations for bookmark orders once placed.